I love finding great books for boys. 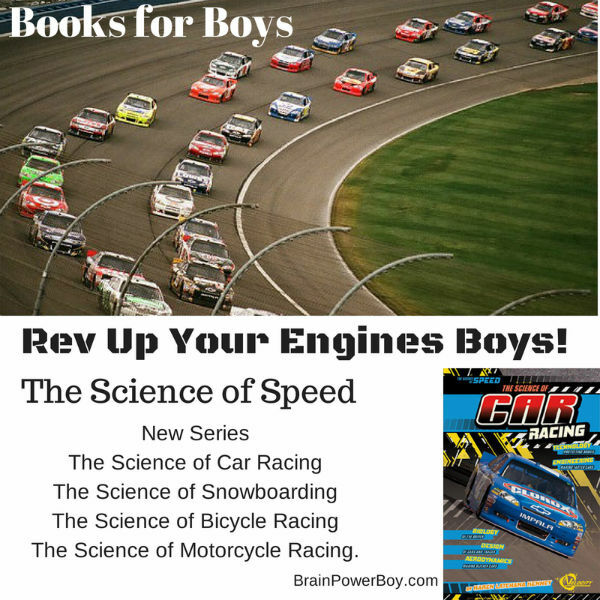 If you have a boy who loves cars and anything that goes fast, you will want to look into this series of books called The Science of Speed. We stared with The Science of Car Racing by Karen Latchana Kenney and plan to check out the other titles as well. Capstone Press is putting out some great books for boys right now. See this review on Batman Science books–neat! This series is all about speed and what it takes to make cars, bikes, motorcycles, and snowboards go super fast. We read The Science of Car Racing which is what this review is based on. The Science of Car racing is a super book. It has detailed diagrams that show how a car engine works. Physics, chemistry, and biology all come into play in car racing and the author lays out the information in an easy to understand way. If there is a word that may be unfamiliar to boys, it is defined at the bottom of the page. I actually liked this a bit better than the usual glossary because the word definition was right there so you didn’t have to keep flipping to the back of the book and looking up words. I don’t know a lot about cars. I like it when I can just get in the car and go where I want to go (don’t you?) I certainly learned a thing or two reading this book. For a boy who is interested in cars it is a great choice and he will likely learn a lot. I want to let you know that this book is pretty straight forward on how it presents information. When talking about safety, Kenney writes “A head injury can kill a driver instantly.” I like that they present the facts but that may be a bit much for a sensitive younger boy. The book is written for kids around 3/4th grade but there are many boys that would like it who are older than that. My son is past that age but thought it was pretty cool. There are sections on the engine, track and car, design and aerodynamics, friction, turning forces and drafting and even kinetic energy. There are even some crashes–for some reasons boys seem to like that–LOL. A lot of good stuff! The book is well done, has great pictures (and a lot of them.) 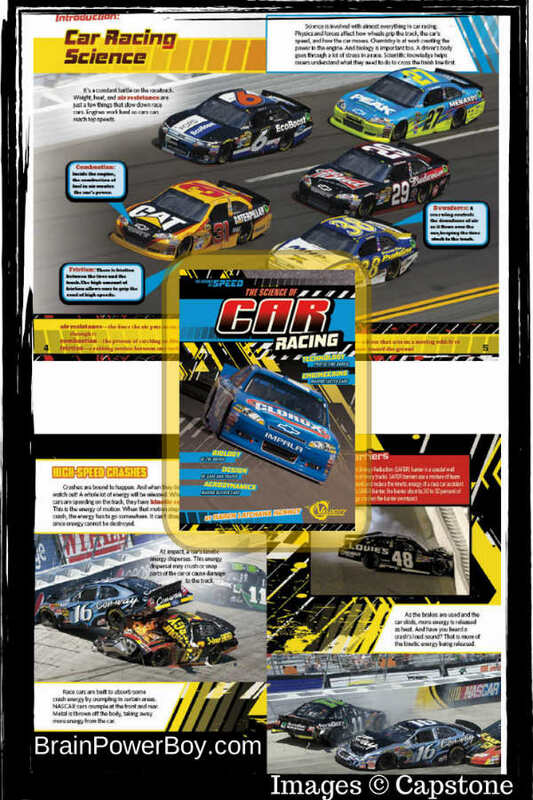 It also has a “read more” section with more car science titles to read–in case your son just has to have more info! I am really impressed by these books. I hope your boy likes The Science of Car Racing . For more books for boys check out our boys’ book reviews. Know another mom with a boy who loves cars? Please feel free to use the sharing buttons below. I love books that give the facts straight and diagrams are always my friend. I have always worked on my own car and I’m happy to let my kids helps when they can! My son would love this book. Thank you for a helpful review. Hi Marie, I hope your kids enjoy the books. Good for you working on your own car. I would prefer not to 🙂 but have done a few things. I’m with you – get in the car and go somewhere, I have no clue what happens under the bonnet (sorry hood!) This looks like a great book though and I know two boys who might like it as a Christmas gift. Glad you enjoyed the review and that you have a couple of boys who would enjoy the books. Bonnet eh? LOL Gabi. Well, I’m sure your daughter would enjoy some of the things on the site too.